Every worker of the door factory “Meranti-plus” applies maximum knowledge and skills so that even the smallest process in a company, even the smallest detail in the ready product can become the key advantages of a company and our clines don’t have question how to choose the interior doors. 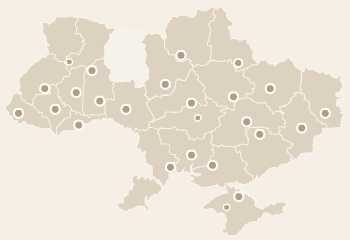 And we are close to the goal. 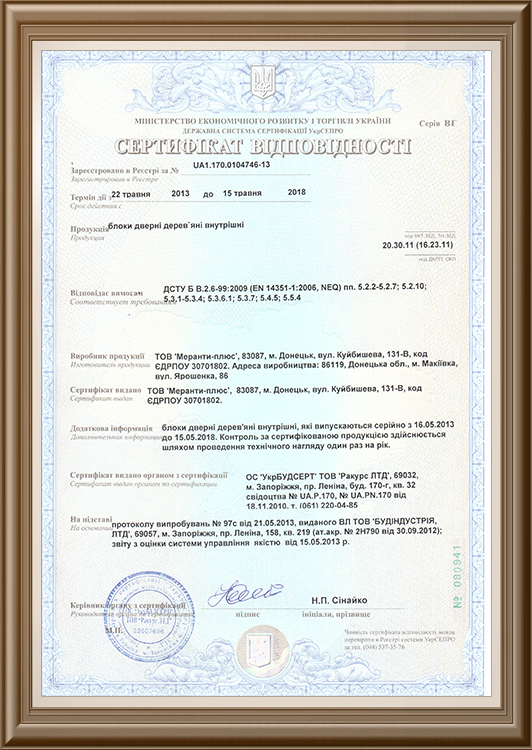 Captive manufacture. For our customer it means that the ready door undergoes the complete cycle within the framework of one manufacturing complex, what allows the company to control a quality of all types of works at any time. The Italian, Spanish and German equipment. In order to ensure the highest quality we use not only the best wood and component parts, first of all we fitted our production with equipment of the best Italian, Spanish and German manufacturers. It allows us to produce the really best room dividing doors in Ukraine underlining the wood strengths and endowing it with the durability of steel. The main technological moments of a manufacturing process of our own-produced doors can be seen here. The involvement of Italian designers acknowledged the best in the world is at the root of production of “Meranti-plus” room dividing doors. For the customer it is a complete observation of the right proportions, and also the high aesthetic value. Traditions and innovations. The manufacturing of doors is based on the age-long traditions of the proper processing of wood, selection of components and also the associated materials. But at the same time, an exclusive quality can be offered only by the company, which combines the stable traditions with the innovative technical solutions. 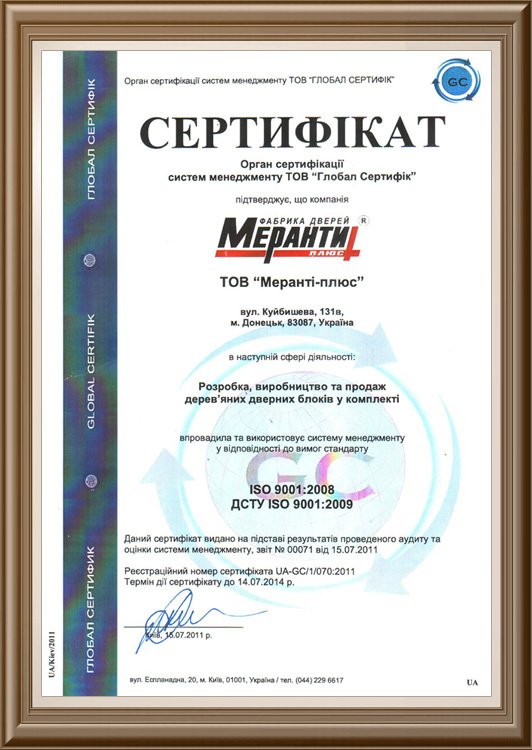 The door factory “Meranti-plus” put the innovations on one of the first places of its attention, which allows to implement the state-of-the-art technologies in production every month and to offer the really unique products by its characteristics to the customers. The wide range of veneers. 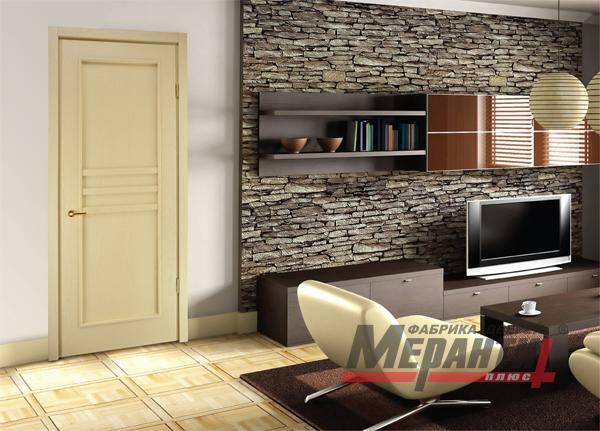 The door factory “Meranti-plus” is the only one core enterprise of Ukraine, which uses an exotic veneer in the process of production of the classical models. As of today we can offer 12 types of veneer and 7 types of the oak veneer tints, and this quantity is increasing constantly. 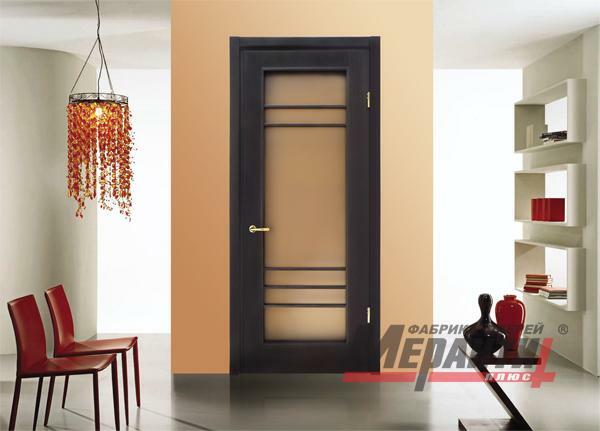 An advanced soundproof of a door with preservation of the high aesthetic qualities. 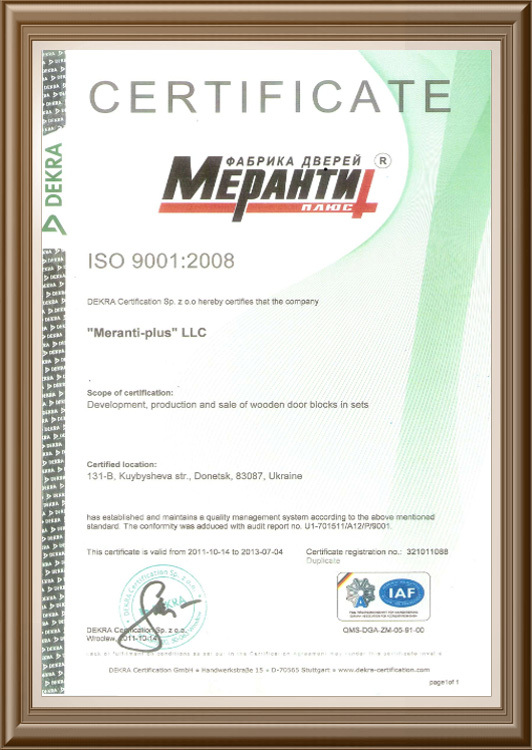 “Meranti-plus” is traditionally associated with the innovative solutions, which can’t be repeated by the other manufacturers. This rule is also applied to the soundproofing matters. Our company is one of the companies in the country, which uses a floating quarter hiding a gap between a door leaf and a door frame, what makes it possible to limit penetration of sound into the room, and the door unit obtains the finished look. At that we also produce traditional non-floating door leaves, and every customer can choose the door according to his preferences. The latest technologies used in “Meranti-plus” allow to produce the door linings of the plane and chamfered form, 60, 65 and 100 mm large, of G-type form (footed, embedded into the erecting slot of the door frame without usage of glue or self-tapping screws), and also of an absolutely chamfered design of the door frame. The adjustable chamfered door frame is 80 mm wide. Owing to the use of dilators there is a possibility to assemble a door lining on both sides on the wall of any thickness. Putting of the paint-and-lacquer materials on the veneer is one of the strengths of the door factory “Meranti-plus”, as the life of a door, retention of its visual characteristics depend on the quality of carrying out of this type of work. The state-of-the-art equipment ensures the even and the deep penetration of applied materials underlining by that the unique texture of wood, and their quality allows to preserve its distinguished properties over a number of years. Enameling. A special hi-tech shop for enameling of the room dividing doors was introduced into the manufacturing complex. The state-of-the-art equipment allows to use the right proportions in an application of material, to form textures, and also to increase significantly the run life of the ready door. 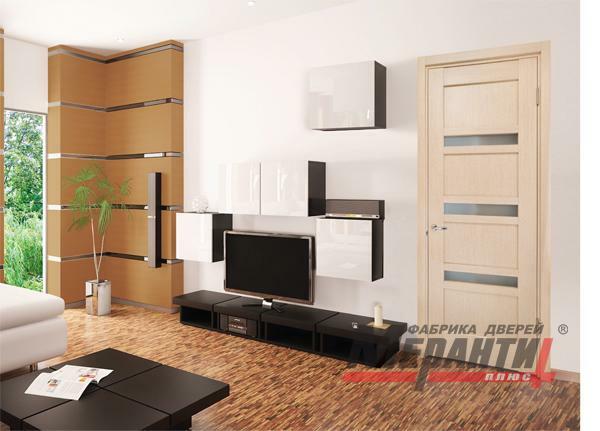 The decorative elements are widely used in production of the room dividing veneer doors by “Meranti-plus”. The doors with the coloured glass embeddings, elements of the stained-glass compositions, panels using sand-blasting and laser finish and many other things are presented at your choice, and the German glass sealant allows to avoid chatter of glass and to cushion the blows. 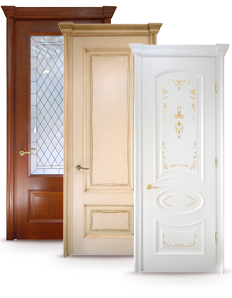 You can become familiar with the variety of door collections by a factory “Meranti-plus” in our company catalogue. 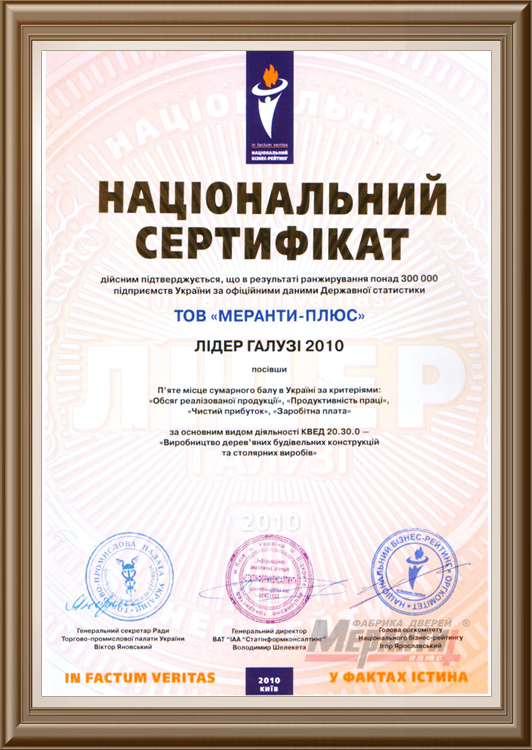 In 2008, 2009, 2010, 2011 “Meranti-plus” door factory was awarded a title of “ The Branch Leader”.